On October 24, a large feature titled “Is the Bible a True Story?” ran in Haaretz—one of Israel’s largest newspapers. The article weighed the archaeological discoveries of the past two decades against a 1999 Haaretz article, “The Bible: No Evidence on the Ground,” in which Tel Aviv University archaeologist Ze’ev Herzog belittled the biblical text. This was far from a strong endorsement of biblical accuracy, but it was a small concession indicating that Hasson and the editors at Haaretz had recognized that the past two decades have brought significant discoveries lending more credence to the accuracy of the Bible. However, while the intent of the article might have been to show how the Bible was making a comeback, that’s not the impression one gets in reading the piece. Instead, Hasson uses much of the article to undermine the Bible’s historicity and scorn archaeologists who would use the Bible alongside their trowel. More than any other period, Hasson took specific aim directly at the period of the united monarchy, the time when the Bible says that King David and his son Solomon ruled from Jerusalem over all Israel and Judah. Let’s analyze the “possible exception” for a moment. 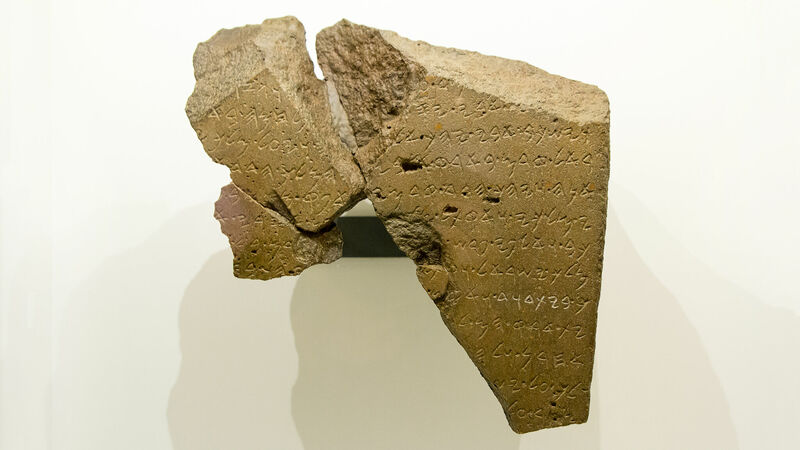 This “Beit David” inscription is found on the Tel Dan Stele, which was discovered in 1993. This dark brown, medium-sized, broken victory stone had been found in secondary use as part of an ancient wall in the northern city of Tel Dan. Its original use had been as a ninth-century-b.c. celebratory inscription belonging to Syria’s King Hazael (mentioned in the Bible), a glorification of his triumphs over Israel’s King Jehoram and Judah’s King Ahaziah (also mentioned in the Bible). And I killed two [power]ful kin[gs], who harnessed two thou[sand cha]riots and two thousand horsemen. [I killed Jeho]ram son of [Ahab] king of Israel, and I killed [Ahaz]yahu son of [Joram kin]g of the house of David. And I set …. When this was first revealed, the inscription came under intense scrutiny, as it should. Bible detractors would not easily accept any artifact that bears the name of King David to be authentic. They advanced many different translations for the stone. Yet after much examination and questioning, retranslating and re-questioning, the Tel Dan Stele was accepted as a genuine piece years ago. This is far from an accurate portrayal of the almost universal acceptance of the Tel Dan Stele as referring to none other than the King David of the Bible. Yet more than just identifying a man, this inscription clearly implies an established royal lineage—known as the house of David (btdwd, as etched onto the stele). It is the same phrase that the Bible uses 26 times to refer to King David’s dynasty, and it was discovered 2,900 years after someone etched it in stone. And it was discovered during a careful, scientific excavation. But let’s not dwell on that. Only “believers” agree that it even references King David. Hasson quoted archaeologist Dr. Doron Ben-Ami, who has led the huge Givati excavation located south of the Temple Mount west of the ancient city of David: “We’ve found the Jerusalem of the 10th century bce, but it was a paltry settlement with no monumental construction. If you are letting archaeology speak, that is what is says.” However, what Hasson failed to mention is that Dr. Ben-Ami has been excavating in the valley to the west of the City of David. Considering that the Bible indicates Jerusalem spread northward from the City of David, it is no surprise that he hasn’t found any monumental construction. The work of one archaeologist who is actually excavating inside the confines of ancient Jerusalem pose some major problems for Dr. Finkelstein’s argument. Dr. Eilat Mazar has discovered the Large Stone Structure (identifying it as King David’s palace) and Solomon’s wall, among other things. Dr. Mazar claims her archaeological discoveries reinforce the biblical account of Jerusalem during the lifetimes of David and Solomon. According to her, there is no need for revision of the biblical text during the reigns of David and Solomon: The stones left behind demonstrate that this city was the capital of a large and powerful kingdom in the 10th century bce. Then without actually looking at the evidence for both David’s palace or Solomon’s wall, Hasson dismissed the discoveries as bogus by quoting an archaeologist saying that Dr. Mazar is simply wrong about the palace and the Solomonic wall. Considering his stated purpose in the article was to discuss how the Bible history compares to what has been found in Jerusalem from the 10th century, why didn’t Hasson go into more depth to understand why Dr. Mazar made such designations? Instead, he just quoted scholars who are openly hostile to the Bible—and whose careers are underwritten by such a contention. If he had asked Dr. Mazar to discuss why she identifies the Large Stone Structure as King David’s palace, she could have told him about the massive eastern wall (6 meters thick) and the massive northern wall (3 meters thick). She could have told him about the pottery related to the structure and several carbon samples that date these walls to somewhere between the 11th and 10th century, the time period of King David and ostensibly the focus of Hasson’s article. She could have explained to him that the Bible actually indicates that King David’s palace should be located in this position, just north of the original Jebusite city. Hearing the facts, maybe he would have agreed that the Large Stone Structure was most likely David’s palace. And if he would have asked for proof of the Solomonic structure on the Ophel, Dr. Mazar could have shown him plans of an absolutely massive structure over 70 meters long with huge external walls and smaller internal walls. If he visited her at Hebrew University, she could have physically laid out the wealth of pottery found adjacent to the structure that dates to the period of King Solomon, pottery that was excavated sitting on floors and sealed underfloor layers. She could have explained to him both sides of the current debate over the dating of the pottery to the 10th century, and describe why she and others believe it fits best to King Solomon. Furthermore, if he had asked her why she apparently finds important discoveries from that time period in Jerusalem while others do not, she could have explained that she is the one excavating where the Bible indicates those structures should be built. If someone else were to excavate these same areas, they would find the same structures and come to the same relative dating. Maybe they wouldn’t put the same label on the structure, but they would still find it. What separates Dr. Mazar from many others is that she treats the Bible as a historical source. And when she finds a massive structure in the location and the time period that the Bible indicates—in this case the 10th century bce—she does not shy away from matching it to structures described by a historical source—in this case the Bible. Those are just some of the questions that seem logical to ask in writing an article regarding the evidence that King David and Solomon ruled the powerful United Kingdom from Jerusalem in the 10th century bce. Maybe Hasson did ask those questions, but the answers certainly did not make it into the copy. Given the massive reach of the Haaretz newspaper, those are some answers that the Israeli public would love to hear about. What a lost opportunity to discuss the dramatic discoveries in ancient Jerusalem. Unfortunately, to refute Dr. Mazar’s discoveries, Hasson instead relied on the opinion of archaeologists whose academic careers hinge on their belief there was no powerful David and Solomon as the Bible describes. You would think that in Israel, of all places, there would be a place for an intellectually honest archaeologist who finds massive structures in precisely the place where the Bible indicates they will be, and who makes logical conclusions based on that reliable source. Does Dr. Mazar believe that the Bible is the infallible Word of God? No. Does she believe that the Bible is the most accurate source available detailing the history of Israel? Certainly! And choosing to side with innocent until proved guilty, Dr. Mazar will continue to look into the Bible while she excavates Jerusalem. To be fair, Hasson did write in the conclusion of this piece that since 1999, discoveries have “lent a little more credence to the biblical tales.” But if you read the article, that sentence feels like it comes a little too late. At 8:30 on Thursday morning, two days after the piece was published, I spoke to Dr. Mazar on the phone and asked her if she had read it. She hadn’t. She was already busy working at Hebrew University putting the finishing touches on Volume 2 of the final report of the Palace of David excavations. I was worried she might be a bit discouraged about the piece. She wasn’t. Instead, she wanted to talk about the final report. She sounded excited about the discoveries and conclusions contained in it. She’s excited after years of work that she will be able to share with anyone who cares to dig for the facts why King David’s palace is the most logical and scientifically acceptable identification for the massive 10th-century building atop the City of David.